Fourteen-year-old Loren’s first mistake was torching the golf course. His next was trusting his mom’s slimy golf pro boyfriend when he said they were going “camping.” Instead, Loren’s mom and her vindictive beau end up dropping him off at Camp Ascend!, a run-down boot camp for wayward teens. The golf course fire was the last straw in a long line of military “maneuvers” the Green Beret-obsessed Loren carried out that finally land him in the dubious care of the “Colonel,” a professional scammer who wouldn’t know a Green Beret from a Navy Seal. The Colonel, his uber-high maintenance wife Kitty and her Neanderthal brother Donovan are the camp’s only staff, and their methods of tamping down turbulent teen behavior are less than orthodox. But they’ve never dealt with a kid like Loren, who actually has some knowledge of espionage & guerilla warfare–even if it only comes from movies. Loren proceeds to turn the camp on its ear by kidnapping Kitty, smoke-bombing Donovan, and stealing the Colonel’s Swiss bank account numbers. But Donovan, whose brain really is the size of a bottle cap, finally gets wily Loren under his ape-like paw. And that’s when the fun REALLY starts. This raucous send-up of a Dr. Phil-type teen boot camp special is a clever indictment of the pop psychology media that touts “tough love” as the answer to all teen troubles. At times Donovan’s pea-brained violent behavior is truly terrifying, but Kitty’s vapid obsession with mail-order spa products and Loren’s dumb-luck escapes help lighten the sometimes dark story. This is the perfect book for those of you who always suspected that adults aren’t nearly as smart as they pretend to be! Brothers Sumo and Duffy are completely confused when they are abruptly yanked out of school one day by a mysterious cousin they’ve never met, Mister Come-and-Go, “the only man in the world to graduate with honors from Cambridge and…go three years undefeated in the International Extreme Street-Fighting Tourney.” When informed by their harried father that Come-and-Go will be taking them for a hastily planned visit to their eccentric, gout-ridden aunt Lulu’s island home of Kocalaha, optimistic Duffy is thrilled while pessimistic Sumo is bummed and more than a little frightened (“Shark attacks!” “Hostile natives!” “Tidal waves!”) Once there, the boys are informed that they will be accompanying Come-and-Go and his crew of native sailors and divers on a dubious “expedition,” presumably for the purpose of leading tourists through the maze of volcanic island paradises. 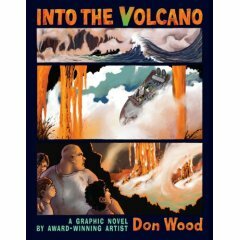 But when Come-and-Go takes the boat straight into the heart of an active volcano, Sumo realizes that the adults aren’t setting a new tourist trap, they’re looking for something–something very valuable and somehow related to his scientist Mom, who is supposedly conducting research in Borneo. Sensing danger greater than that they have already faced, Sumo and Duffy set out on their own to discover the secret of the volcano for themselves. And that’s when the REAL adventure begins…my adolescent friends, I have never seen anything quite like Don Wood’s Into the Volcano. While the art and lettering remind me somewhat of my favorite indi-graphic novel, The Interman , Wood takes it to a new level, his frantically kinetic panels depicting earthquakes, breaking waves and flowing lava so immediately you feel as if you are right with Sumo and Duffy in the thick of the action. And there is non-stop action, which takes off by page 30 and explodes, burns, and plummets to the very end. But least you think that Wood is all brawn and no brain, there is a moving story beneath all the adventure–the story of how petty Sumo transforms from a whiny coward into a real hero. This all-ages action adventure, also riddled with fascinating facts about volcano formation, will engage everyone from Anthony Horowitz fans to MythBusters aficionados. So take a deep breath and venture Into the Volcano. I promise you won’t be disappointed! “He’s Mexican because his family’s Mexican, but he’s not really Mexican. 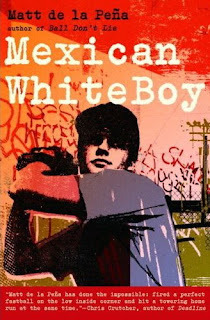 His skin is dark like his grandma’s sweet coffee, but his insides are as pale as the cream she mixes in.” Danny Lopez is torn between the private school world of his divorced white mother and the San Diego barrio of his Mexican father’s family. Feeling like he doesn’t fully belong in either, he focuses on his passion for baseball, and improving the erratic pitches that have kept him off the prep school team. When his mother decides to go live with her wealthy white boyfriend in San Francisco, Danny opts instead to spend the summer with his father’s family in San Diego. There he meets Uno, a trash-talking half black, half Hispanic kid, also with a divorced mom. Uno understands Danny’s split background and helps him use his fast pitch to cook up hustles at local ball fields. These two boys have Big League dreams. But they’ll both have to learn to come to terms with their mixed heritages and the confusing roles their absentee dads have played in their lives before they can achieve their goals. Matt de la Pena scores a home run with this richly characterized story of two boys struggling to discover the sort of men they want to be. Full of authentic, raw dialogue liberally peppered with Spanish, de la Pena’s follow-up to his thought provoking first novel Ball Don’t Lie is powerfully reminiscent of Paul Griffin’s Ten Mile River and Coe Booth’s Tyrell. An unexpectedly lyrical and poignant read about teens from the wrong side of the tracks trying to make good.